Just got a fresh image of Raspbian Jessie for my Raspberry Pi 3 B. Updated everything (apt-get update, apt-get upgrade and rpi-update). I'm trying to stream audio from my iPad to the Raspberry. Run apt-get install pulseaudio pulseaudio-module-bluetooth (did not use pavucontrol or bluez-firmware). apt-get install bluez (for pairing visually). Has anyone the a2dp streaming working on the RPI 3 with WLAN enabled, and is there anybody with a solution? I suspect some kind of conflict between Bluetooth and WiFi but can't reproduce a fault reliably. My symptoms are, if I use my Bluetooth mouse with my Bluetooth keyboard and WiFi then I get a variety of nasty side effects from outright hangs to the keyboard disconnecting and being extremely difficult to reconnect. If I run USB mouse, Bluetooth keyboard and WiFi my Pi3 is stable. Do you think this is a hardware or software issue? You have to consider that previously with a Raspberry Pi2 + a dongle for WiFi and + one for Bluetooth, with the same software installed (pulseaudio 5.0 and Bluez 5.35) I did not have this issue. Do you think that I should try to install Bluez 5.35, instead of default 5.23? Pretty sure it is hardware/firmware - if you check the post I linked by emw (s)he can avoid problems by using a bluetooth dongle on their Pi3. I have a bluetooth dongle and when I get the time plan t try it on my Pi3. 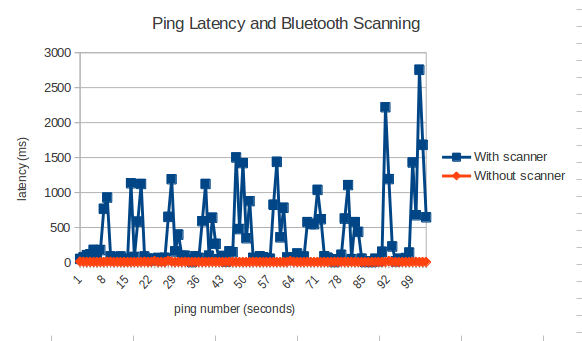 When I attempt to make a connection to a a bluetooth LE device and the connection does not establish (or the device does not exist), wifi is disable (or has >99% packet loss) while the bluetooth LE connection is being attempted. Note: bluetooth LE will continue to attempt the connection even after hcitool returns with a timeout error. Looking at the data on wireshark I see the occasional packet is making it through... but very few. Could any one shed some more light on this, or suggest a work around? Confirmed the same behaviour on Ubuntu Mate. Until no change in firmware (if anyhow possible to solve this from HW pov) workaround is simple. For now either WiFi or BT dongle is needed to work these two services together reliably. BTW: I also could not get the built-in WiFi-N to create a fast Wifi hotspot - thus I would try to expermient with external Wifi-N USB dongle. Pi's bluetooth LE - seems to be energy efficient and worth to use. Personally I have impression that USB bus is the most reliable part of Pi3. Do you know any WiFi dongle recommended ? There seem to be some improvement to the wifi operation (at the expense of the bluetooth) in last weeks release of raspbian. You may want to try this for your application. I can confirm this, and posted this chart of my simple experiment in another thread.